Phillips’ wish was granted when Fourth Street was renamed Vel R. Phillips Avenue at a ceremony on Tuesday. The dedication was part of the sixth annual Bronzeville Week, scheduled between Aug. 4 and 11. “We decided to do this during Bronzeville Week, because Bronzeville is an iconic place in the city of Milwaukee for African-American arts, culture and commerce,” Coggs said. Phillips was the first black woman to graduate from the University of Wisconsin Law School and to serve on Milwaukee’s Common Council. She was Milwaukee County’s first female judge and the first black person to be elected to a statewide executive office. Phillips was instrumental in the 1967-68 Milwaukee fair housing marches, introducing four open housing bills as an alderwoman and marching alongside NAACP Youth Council members, who demonstrated for 200 days. According to Coggs, Phillips believed that Milwaukee had done Dr. Martin Luther King Jr. a disservice in not allowing the street named for him to extend to St. Paul Avenue. Dr. Martin Luther King Drive parallels parts of Interstate 43 and lies between Keefe Avenue and Pleasant Street. Mayor Tom Barrett, Phillips’ son, Michael Phillips, and the first Vel R. Phillips Trailblazer award recipient, Jasmine Johnson, spoke at the ceremony. The Vel R. Phillips Trailblazer award was established to commend people who embody Phillips’ spirit and work ethic in social justice. The Milwaukee Common Council voted unanimously to establish the award on April 17, the day Phillips died. Johnson, entrepreneur and former chair of the NAACP Milwaukee Young Adult Committee, said, “I challenge every one of you to ask yourselves daily… ‘Are you doing what you’re supposed to do, and are you doing your part?’” Johnson noted that Phillips asked her this question at their every encounter. Following the presentations, attendees were entertained by a live band and given an opportunity to take trolley rides on the renamed Vel R. Phillips Avenue. According to Coggs, Phillips wanted Fourth Street to be named after her because of its significance in her life. Phillips attended Historic Garfield School, which is now the Historic Garfield Apartment building, 2215 N. Vel R. Phillips Ave. Also, she belonged to and was married at St. Mark AME (African Methodist Episcopal) Church, now at 1616 W. Atkinson Ave., when it was located on Fourth Street. 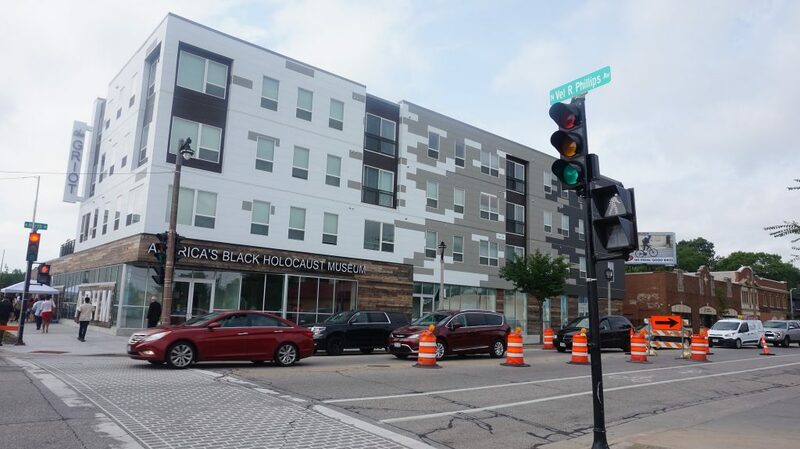 The Griot Apartments and America’s Black Holocaust Museum (ABHM), 2233 and 2234 N. Vel R. Phillips Avenue, were recently constructed on the street. Coggs said it was “only fitting” that Phillips be honored during the week celebrating developments in Bronzeville. 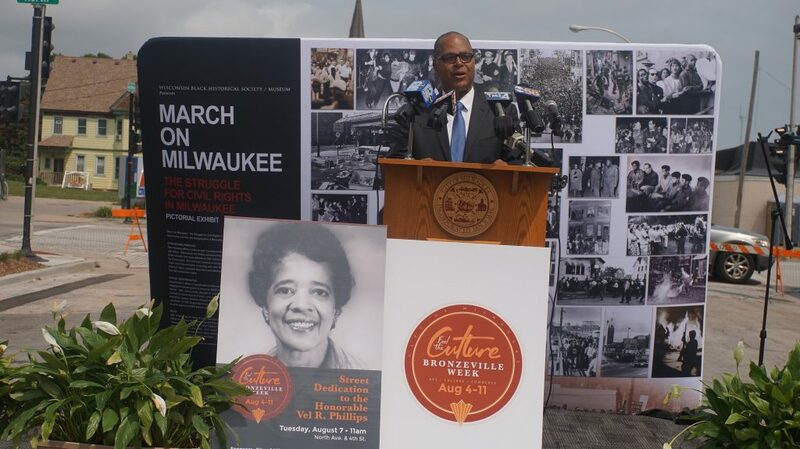 Bronzeville Week is co-sponsored by the City of Milwaukee, Bader Foundation, Historic King Drive BID, Milwaukee Bucks and VISIT Milwaukee, among others. The annual Arts and Cultural Festival and HaRUNbee 5k Walk/Run were held last weekend, along with the Live on King Drive family-friendly, musical event. The Bronzeville Business Breakfast highlighted longtime businesses in the area, according to Lilo Allen, whose pop-up shop, Papyrus and Charms, is on the corner of Vel R. Phillips Avenue and North Avenue. A variety of Bronzeville Week events allowed people to make art while enjoying food and beverages. Festivities also included an art walk and a black food truck festival. The week also featured a panel discussion about Milwaukee’s national influence, which was hosted by ABHM. Throughout the week, the MLK Heritage Health Center, 2555 N. King Drive, offered health screenings for HIV, hepatitis C, high blood pressure and glucose, in addition to providing immunizations. Bronzeville encompasses the area between Garfield Avenue and Center Street, and between Dr. Martin Luther King Drive and Seventh Street in Coggs’ Sixth Aldermanic District. It was inspired by Milwaukee’s original Bronzeville, which was located on Walnut Street and was an economic capital for black business owners. Editor’s note: This story has been updated to correct where Vel Phillips went to law school. We apologize for the error.